To examine racial differences in smoking rates at the time of breast cancer diagnosis and subsequent survival among African American and non-African American women in the Carolina Breast Cancer Study (Phases I/II), a large population-based North Carolina study. We interviewed 788 African American and 1,020 Caucasian/non-African American women diagnosed with invasive breast cancer from 1993 to 2000, to assess smoking history. After a median follow-up of 13.56 years, we identified 717 deaths using the National Death Index; 427 were breast cancer-related. We used Cox regression to examine associations between self-reported measures of smoking and breast cancer-specific survival within 5 years and up to 18 years after diagnosis conditional on 5-year survival. We examined race and estrogen receptor status as potential modifiers. Current (vs never) smoking was not associated with 5-year survival; however, risk of 13 year conditional breast cancer-specific mortality was elevated among women who were current smokers at diagnosis (HR 1.54, 95% CI 1.06–2.25), compared to never smokers. 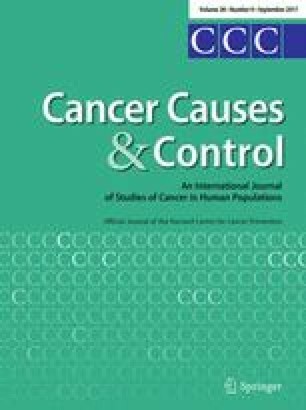 Although smoking rates were similar among African American (22.0%) and non-African American (22.1%) women, risk of breast cancer-specific mortality was elevated among African American (HR 1.69, 95% CI 1.00–2.85), but only weakly elevated among non-African American (HR 1.22, 95% CI 0.70–2.14) current (vs. never) smokers (P Interaction = 0.30). Risk of breast cancer-specific mortality was also elevated among current (vs never) smokers diagnosed with ER− (HR 2.58, 95% CI 1.35–4.93), but not ER+ (HR 1.11, 95% CI 0.69–1.78) tumors (P Interaction = 0.17). Smoking may negatively impact long-term survival following breast cancer. Racial differences in long-term survival, as related to smoking, may be driven by ER status, rather than by differences in smoking patterns. The online version of this article (doi: 10.1007/s10552-017-0923-x) contains supplementary material, which is available to authorized users. This research was funded in part by the University Cancer Research Fund of North Carolina and the National Cancer Institute Specialized Program of Research Excellence (SPORE) in Breast Cancer (NIH/NCI P50-CA58223) and by the National Institute of Environmental Health Sciences (T32 ES007018). All procedures performed in the Carolina Breast Cancer Study involving human participants were in accordance with the ethical standards of the Institutional Review Boards of the University of North Carolina at Chapel Hill and were in compliance with the 1964 Helsinki Declaration and its later amendments or comparable ethical standards.